Somerville, Mass - Sometimes, it's so hot in the pink house that there is nothing you can do but go to the movies. Such was the case last weekend, when we saw Cold Souls, the funny and probing comedy starring Paul Giamatti and Dina Korzun. Apparently, starring in a Chekhov play can really get a guy down. When Paul Giamatti (who plays himself) is unable to separate the angst of Uncle Vanya from his everyday life, he takes desperate measures. An article in the New Yorker leads him to solicit a service called "Soul Storage" which promises to lighten his load for the duration of the show. His soul is extracted - it looks remarkably like a chickpea, which is a source of endless amusement throughout the film - and stored safe and sound in a little locker. Unfortunately, it's not exactly a clean break. Without a soul, Giamatti becomes alienated from everything he used to care about. He can't act (the scene with the soul-less Giamatti doing Uncle Vanya is priceless); he can't make love to his wife; he can't do anything except stare at his feet. Alas, when he returns to the soul storage facility to retrieve his little garbanzo bean, he discovers it has been stolen - absconded by a group of ruthless Russian soul trafickers. Dina Korzun plays an icy Russian blondinka - the mule who moves the priceless goods across borders. But she seems to have a soft spot for Giamatti (we might say that she was "able to get a sense of his soul" when she transported it to Russia). Ultimately, she agrees to take Paul to snowy St Petersburg in pursuit of his soul. The scenes shot in Russia are magnificent - so beautiful and bleak. Giamatti spends a lot of time walking along the ice-clogged Neva River wearing a furry hat. Especially when it's 90 degrees wherever you are, the film effectively evokes a sense that he is a stranger in a strange land. A few views of the Petersburg skyline hint at the grandeur and grace of this city; but without his soul, Giamatti is really shut out from appreciating it, and so are we. Every once in a while, somebody makes a clever film that both makes you laugh and makes you think. Director Sophie Barthes has done it here. So next time you need a cool-down, get yourself to the cinema to watch Cold Souls. Somerville, Mass - Regular readers will know that this year I joined the Food Project CSA, which has resulted in a weekly bounty of vegetable goodness - often in the form of vegetables that I do not know what they are, let alone how to cook them (click here to learn what I did with my Chinese cabbage). I do not have that problem with beets. I have spent enough time in Russia to appreciate this sweet tuber in all of its crimson-colored glory. In fact, when I return home from Russia, I often suffer from a little bit of beet withdrawal. In a large stockpot, saute the onion and garlic in olive oil until soft. Add stock, carrots and beets, plus salt and pepper. Bring to boil and simmer for 30 minutes. Stir in tomato juice and sugar and continue to cook for another 30 minutes. Let the soup cool to room temperature, then stir in lemon juice. Add salt and pepper to taste. Chill overnight in the fridge. Garnish with fresh dill. Cool refreshing goodness. Adapted from A Taste of Russia by Darra Goldstein. Concord, Mass - I'm sorry to go on and on about the heat and humidity. To be honest, I love it. I mean we went through June and July without much of summer, so thank God we experiencing it in August. That said, the pink house is not the perfect place to be in this weather. The heat gets trapped in there and it feels like a sauna. The ceiling fans are going full tilt, but it offers only an iota of relief. You're not even moving and you're dripping sweat. You go to get yourself a cold drink from the fridge and you trip over a cat corpse. Yesterday we no choice but to hop on our bikes and ride to Walden Pond. It's about 17 miles each way, with a few killer hills, and a delightful dip in the pond's cool crystalline waters as a reward. Glory hallelujiah, that Thoreau had the right idea! Of course the tiny beach at Walden Pond was packed as per usual, but if you wander away from the crowds (as Thoreau did) there are all kinds of nooks and crannies where you can find your own private piece of pondside paradise. The water is delicious - cool enough to refresh, warm enough to float around for hours, which is exactly what I did. As an extra treat, there is always the ice cream truck that sits in the parking lot. On a hot day, there is no better energy snack than a good old-fashioned ice cream sandwich. I know what you are thinking. 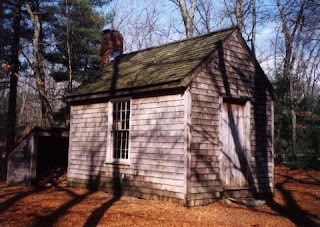 Certainly Thoreau didn't have ice cream sandwiches and such luxuries when he lived for two years in a little shack on the shores of the pond. Maybe not... but he did frequently make the two-mile trek through the woods to have dinner at the Emersons' in Concord. So he was pretty well taken care of. Thoreau wrote "I went to the woods because I wished to live deliberately, to front only the essential facts of life, and see if I could not learn what it had to teach, and not, when I came to die, to discover that I had not lived..." And I went to the woods because I wished to splash around in the cool water and eat ice cream sandwiches. I think we can understand each other. 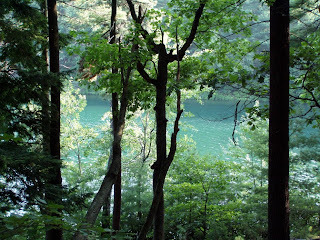 Photos courtesy of Walden Pond State Reservation. 1 - Graffiti. He got his start as a street artist - plastering posters and stickers and paintings in places where (apparently) it wasn't wanted. It's illegal. He's a criminal. Personally, I don't have a huge problem with this. I think street art can be interesting and even attractive - adding an undercurrent of creativity to the urban grit. In Fairey's case, it looks cool AND it asks probing questions. Certainly I'd rather look at the Obey giant than a billboard screaming at me to drink Heineken, even if the former is illegal and the latter is not. 2 - Plagiarism. Many of Fairey's best known works have borrowed images that are in the popular culture. Most famously, the Obama "Hope" poster is based on an AP photograph (the AP has filed a claim against Fairey, which currently being disputed in court). In fact, many of Fairey's pieces reference photographs, advertisements and propaganda posters that were originally created by other artists. Click here to see some examples of this. Nobody can contest the fact that Fairey's artwork borrows from other sources; but that is the whole point. He borrows images, many of which we are bombarded with on a daily basis, and he alters them in a way that forces the viewer to question their meaning. He borrows techniques and styles and uses them to convey unexpected or ironic messages. This juxtaposition between familiar and defiant is exactly what makes his work so powerful. So again, some call this plagiarism, but I don't have a huge problem with it. Maybe Fairey should credit to the original artist, like a footnote. I think that would go a long way toward appeasing many of these artists, who probably never got nearly as much attention for their work as Fairey gets for his. 3 - Sell Out. 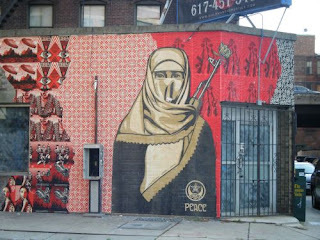 Fairey started out as a renegade street artist, questioning authority, promoting peace and critiquing consumer culture. Now his art hangs in fancy galleries. He has applied the name "Obey" to a line of streetwear and skateboards. He has a steady stream of corporate clients. Of all the criticisms, this is the one that I can't shake. I can't blame the guy for wanting to make a buck. Really, he deserves it. There are plenty of socially-responsible enterprises that are also financially successful; going "corporate" does not automatically invalidate his message. But when the message changes.... that invalidates the message. 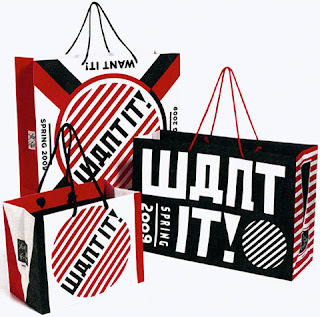 This is a marketing campaign that Fairey designed for Saks earlier this year. Anyway, you gotta give the guy credit for generating a buzz. I have never witnessed so much excitement over an art exhibit in Boston. Everybody had an opinion... about art! According to artdaily.org, Supply & Demand has been the ICA's most popular exhibit to date, attracting upwards of 100,000 visitors. Although I did not have super high expectations for the exhibit, I was impressed. The artwork was much more diverse than I expected. Sure, Andre the Giant made his presence known, but the themes were wide-ranging, incorporating poster art, murals, money and music. I think posters are an under-appreciated and under-utilized art form in our society (see my previous post about poster art in Poland), but this is obviously Fairey's strength. He uses styles and techniques (and some characters) from communist-era propaganda posters - a medium which is obviously close to my heart. His message was also more diverse than I expected. The ubiquitous theme is "Obey". (Obey whom? you ask, which is exactly what Fairey wants to you question.) But his artwork addresses politics, war, environmentalism and fanaticism. He's not just spouting a slogan; I really felt like he wanted his viewers to think about these issues. And not for nothing, most of his work is really cool to look at. Bold colors and two-dimensional images contrast with elaborately stencils that are layered on top of other patterns and colors. When this is a mural that covers an entire wall, the effect is pretty awesome, and that's speaking purely about aesthetics. Incidentally, the ICA opened the Supply & Demand exhibit last February with a huge gala attended by some 700 people. Fairey himself was scheduled to DJ the party, except that he never showed up. He was detained on his way to the museum - arrested on two outstanding warrants for defacing public property. You can't blame the Boston police for wanting to make an example out of Fairey. And frankly, he is a graffiti artist, so it comes with the territory, right? Part of his appeal is the fact that he's rebellious and he's out-there. Fairey should thank the police for reminding the public that he's a renegade (lest we forget). 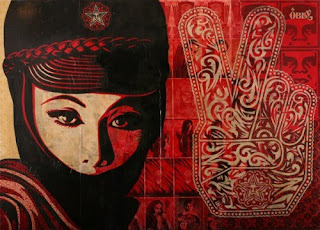 Photos courtesy of obeygiant.com and art-for-change.org. Salem, Mass - Not that I need an excuse to take the ferry up to Salem to visit the superb Peabody Essex Museum. 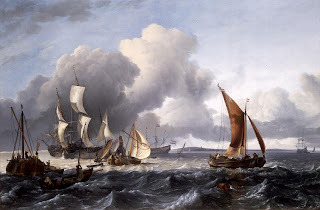 But I had one: a special exhibit on the Golden Age of Dutch Seascapes. Just like Catherine the Great, I have a special interest in Dutch art, due to a little side project I have brewing. (I'll say no more, but hopefully you'll hear more about this in the future.) The seafaring theme is appropriate not only for my mysterious project, but especially for the PEM, which was founded by the East India Maritime Society, whose member ships were instructed to bring back "natural and artificial curiosities" for the education and enlightenment of the public. 1 - Ferry Ride. The high-speed ferry departs from Long Wharf in Boston and arrives in Salem Harbor less than one hour later. The breezy boat deck offers great views of the Boston Harbor Islands and the North Shore, and a sweet sunset on the way home. Very civilized. 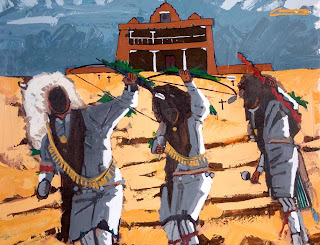 2 - Native American Art. Although we came for the Dutch, we couldn't resist looking around the museum's permanent collections, which are vast and varied. They are arranged geographically, with emphasis on Africa, Asia, Oceana, India and the Americas. What I love is that historic pieces - including folk art and handicrafts - are displayed alongside contemporary pieces. So it shows these exotic places with living, breathing dynamic cultures. This was especially striking in the exhibit dedicated to Native American art, since this exotic culture exists in our own country, which we sometimes forget. At least I do. 3 - Funky post-industrial yard art. What a delightful surprise. As we stepped off the ferry and started to walk into town, we came across an old stable - its yard crammed with funny and funky creatures. Birds and beasts made out of thingamajigs and dohickeys and other industrial whatnot. "Come inside" invited a hand-written sign, thus opening up a fantastical world of creative whimsy. I took some photos on my phone but I'm embarassed to admit that I don't know how to transfer them to the computer. You'll have to check it out yourself when you go to Salem: you can't miss it as you exit the ferry. Photos courtesy of the Peabody Essex Museum. Provincetown, Mass - Heat got you down? In my opinion, when the thermometer hits 90 degrees, there is really only one place to be, and that's in the water. In anticipation of the summer's first really hot days, we headed to Provincetown on Sunday. That was a good move. Number one, drive to Cape Cod on a Sunday morning. Sure there will be a lot of cars, but they will all be headed in the opposite direction. Number two, drive all the way to the Cape Cod National Seashore. This is an endless strip of pristine beach backed by gorgeous dunes and salt marshes. Okay, it's not endless, but it is 40 miles long, so it is seemingly endless. The beach will be crowded near the entrance, but you can just keep walking until the humans dwindle out. Walk for 10 minutes and you will have as much sand as you could possibly want - all to yourself. The sign at the ranger station claimed the water was 63 degrees, but I didn't believe it. It was supposed to be 62 degrees at Crane's Beach last week, and that water was frigid. The Cape catches the edge of the Gulf Stream, which means the water was delightfully refreshing - but warm enough to stay in and float around for as long as we wanted. No waves, though. No boogie board action. The National Seashore also has about 12 miles of bike trails that wind through the dunes. I had my heart set on vegging on the beach on this particular outing, so we decided not to bring the bikes, but this is a beautiful place for a leisurely ride. Highly recommended for not-too-serious bikers. We packed a picnic, played Scrabble, read books and flew kites - perfect beach day. In the evening, Provincetown was hopping. We spent an hour or two browsing in the art galleries on Commercial Street. We often end up bringing something home - this time it was a coal-mining dwarf, who is now taking a break in the garden behind the pink house. We have quite a collection of creatures back there. Afterwards, we decided to forego the gay cabaret, which is P-town's best form of entertainment. Instead we sat at the bar, watching the Sox and sucking down cold beers and Wellfleet oysters. In case you needed additional reasons to go to Cape Cod, I just gave you a dozen more. Slurpy, salty, succulent goodness, times twelve. Monday morning was cloudy, so we lost some of our valuable beach time. But we were back out there as soon as the sun broke through. Beach blanket heaven. Sadly, we had to cut the day short to drive back to Boston on Monday afternoon. Still, I was glad we had made the trip, especially on the way home when I saw that the thermometer at Cambridge Savings Bank read 92 degrees. Ooh ma-ma! In case you are wondering why we had to get back to Boston (seeing that I am a lady of leisure these days), it's because we had to pick up our two newly-adopted family members. The pink house is a cat house once again! If that doesn't cure your summertime blues, nothing will! #1 - Bike ride from North Reading through historic Ipswich and beautiful salt marshes to Crane's Beach. #2 - Cycling tour around the Crane Estate and a delicious cooling dip in the 62-degree ocean. That's chilly water, but when you've been pedalling for three hours in the 90-degree heat, it feels pretty good. #3 - Steamers from Woodman's, a New England institution. #5 - Massive traffic jam on the way back to Somerville (okay, I might strike that part from the perfect summer day - but at least I discovered a new way to get from I-93 to my house; desperation breeds innovation). 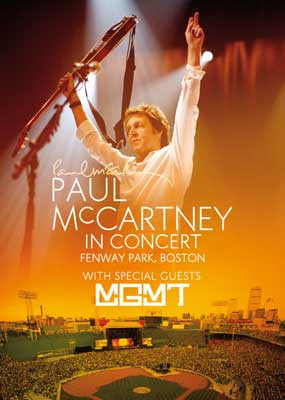 #6 - Fenway Franks for dinner and Paul McCartney singing beneath the Citgo Sign. Somerville, Mass - As a follow-up to my previous post, here are some great things about Detroit that you probably didn't know about - unless you are from Detroit yourself. One for each day I spent in the Motor City. 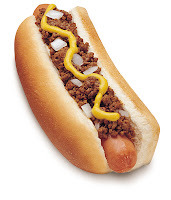 National Coney Island - Oh, Coney, how I love thee. And not only sitting at the counter and sucking down chilli dogs and thick chocolate shakes, but also my many sweet memories of the summer of 1990. How frightening that that was 20 years ago that I worked the counter at Moross & Mack, but it still feels like home. 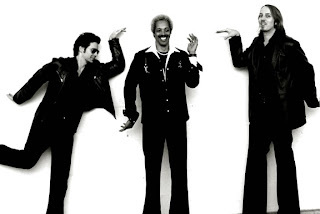 The Brothers Groove - I mention this funky fusion jazz group because I went to high school with the keyboardist, Chris Codish (and because they are awesome), but it is only one of many groups to come out of Detroit. It's hard to deny that Detroit still has one of the country's best music scenes. Rock on, Motown! MOCAD - Many native Detroiters don't even know about the newish Museum of Contemporary Art of Detroit. It's not a big place, but it's in a cool recycled building that was converted from an old car dealership. The front is covered with graffiti, complete with graffiti artist. 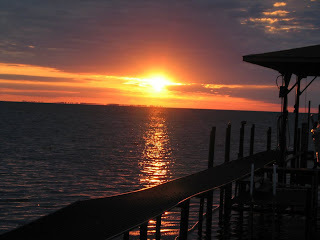 Lake St Clair - Technically, Detroit is not on the lake, but its eastside suburbs are. It may not be a Great Lake, but it is a great lake. I spent so many summer days floating on a raft on her gentle waters - so many summer nights sneaking out for a midnight dip. I get homesick everyday the temperatures in Somerville goes above 80 degrees (like today).